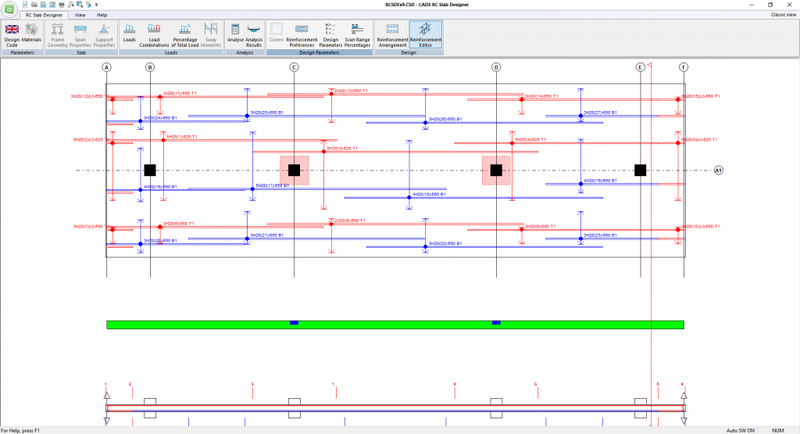 CADS RC Slab Designer provides fast, automatic RC design to BS 8110 for all typical bar arrangements, mesh and slab configurations and can be used standalone or as part of the CADS integrated analysis, design and detailing solution. It can check a user-defined base design or autodesign an optimum solution to suit user and code criteria. Batch processing and common design groups are available when integrated into CADS A3D MAX. Calculations and details of the selected solution can be printed onto a single A4 sheet or exported to Microsoft Word and detailed automatically in AutoCAD using the CADS RC Slab Detailer Macro. 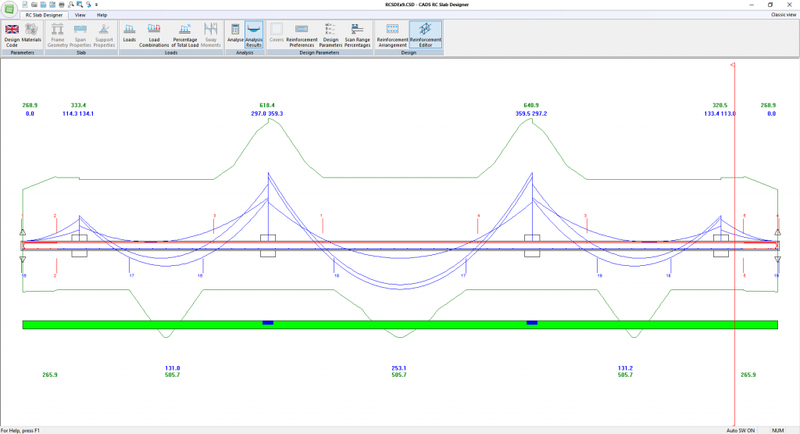 Slab geometry and supports such as beams, walls, and rectangular, elliptical or circular columns with or without flared heads are quickly defined via an easy to use input dialog. CADS RC Slab Designer can accept area, uniform, distributed, point, line, triangular and trapezoidal load types. Sway moments derived from a full frame analysis can be entered with the resulting shear forces automatically considered in the design. The software performs BS 8110 load patterning and also provides optional automatic ‘worst case’ combinations. 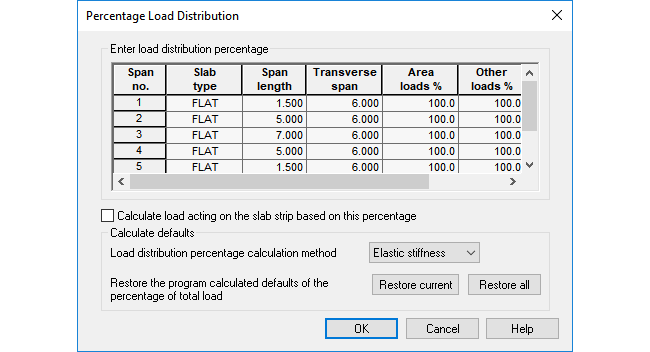 The user can choose whether load types such as partitions, services, ceilings, etc are considered as ‘pattern’ or ‘constant’ dead loads via a simple tick box selection. If it is advantageous to do so users may optimise the moments envelope by redistribution. 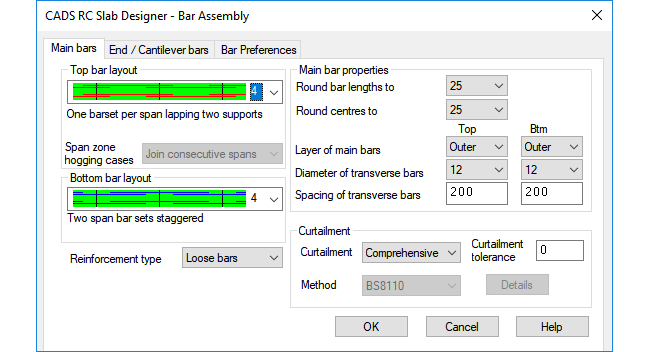 Users can specify their preferred bar assembly from a choice of 6 bottom and 7 top bar arrangements. 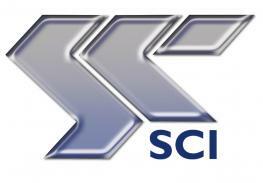 Users can automatically produce designs rationalised according to their preferred bar spacing or multiples thereof throughout the slab. 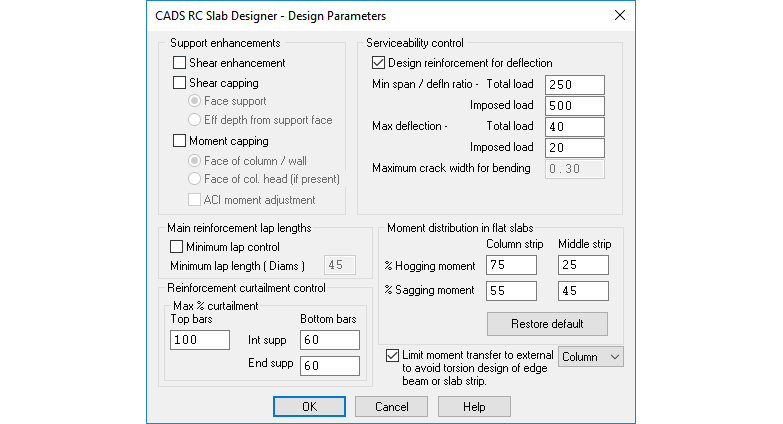 CADS RC Slab Designer uses current rebar supply and fixing rates to automatically optimize bar sizes and spacing for the most economical design. CADS RC Slab Designer allows the user to choose between ‘mesh fabric’ reinforcement and ‘loose bars’ and quickly compare the results. 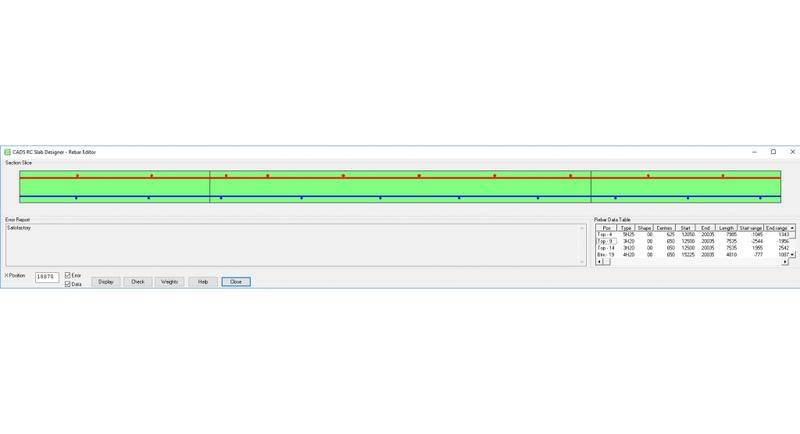 The software checks for punching shear around columns at a perimeter 1.5d from the column/ column head and at 0.75d intervals until a perimeter is reached which does not require shear reinforcement. The required density of shear links is reported. The software warns the user if the column/head size or slab depth needs to be increased. CADS RC Slab Designer offers a choice of ‘Comprehensive’ or ‘Simplified’ curtailment rules. Users can accept the default BS8110 Simplified Curtailment’ rules or modify and save new rules to suit each job. A tolerance defines the minimum difference in bar lengths to avoid creating too many bar sets with small differences in length. CADS RC Slab Designer provides a selection of printed calculations, a detailed drawing and fixing schedule, all on headed and numbered sheets. It also exports to Word.